Some really good work by the Trib here. The Texas Tribune spent almost a year attempting to collect information on police shootings from departments in the state’s 36 largest cities, which have a population of 100,000 or more, and was able to confirm 656 fatal and nonfatal shooting incidents involving 738 individuals that occurred between 2010 and 2015. Those 36 cities make up almost half of the state’s population. It remains impossible to determine exactly how many more times police officers in Texas pulled the trigger, and the data vacuum isn’t just about total shooting incidents. At a time when much public attention — and political debate — is focused on police shootings of minorities, it is also virtually impossible to know how many shootings in Texas involve Hispanics, the state’s largest minority group, because some departments don’t distinguish between race and ethnicity in their records. Frustration over the lack of readily available, standardized and reliable data on police shootings is widespread among lawmakers, criminologists and the general public, particularly after several deadly shootings — like those in Ferguson, Missouri, Minnesota and Baton Rouge — that have garnered national attention. The FBI tries to collect nationwide data, but its statistics are incomplete and riddled with mistakes. Texas lawmakers passed legislation in 2015 requiring statewide reporting, but those efforts won’t capture all police shootings in the state. Access to comprehensive information rests almost completely in the hands of local police departments. Departments in big cities, such as Houston and Dallas, post information on every police shooting on their websites. But a list from most departments can only be obtained through an open records request — and often after a fight over what information should be made public. National record-keeping efforts are also inconsistent. 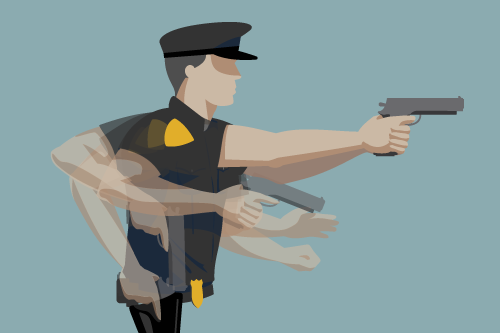 The FBI’s database of police shootings — based on voluntary reporting by departments, which fluctuates from year to year — only includes fatal shootings, and even those are often undercounted. From 2010 to 2014, the latest year for which FBI data is available, the Tribune confirmed at least 198 fatal shootings by the 36 departments examined. But it appears at least 89 fatal shootings were either not reported to the agency or reported incorrectly. Additionally, the FBI’s incomplete database only counts fatal shootings, which the Tribune’s analysis shows made up just 36 percent of all shootings in Texas during that time. Calling the current system a “travesty,” the FBI has said it plans to revamp its system for tracking police shootings in 2017, including expanding reporting to note other injuries caused by police. That would still miss instances in which police shoot but miss. From 2010 to 2015, 142 of those incidents made up more than one-fifth of all shootings in Texas’ biggest cities. Read the whole thing, and be sure to click on the other stories in the series as well. We can’t understand the situation, let alone make sensible reforms as needed, if we don’t have the basic facts of it. Shootings are also only one piece of the puzzle, as people die in police custody for other reasons as well. That information is supposed to be collected but often isn’t, and the information we do have is not readily available. Grits for Breakfast contributing writer Amanda Woog, who is a postdoctoral fellow at the UT-Austin Institute for Urban Policy Research and Analysis, has been working on this, with the data she has gathered at the Texas Justice Initiative website; here’s a podcast conversation with her about it. We need to know what is actually happening, we need all relevant entities to report their data in a timely and cooperative fashion, and we need to ensure there are consequences for not complying. Then we can move forward. Why isn’t there a reporting mechanism for each discharge of a law enforcement officer’s weapon (stun guns included)?